By Anthony I. Zarka, D.O. This teenage boy presented with chronic progressive neurological deficits involving the lower extremities. A contrast enhanced CT shows an expanded, rarefied T3 vertebral body with disruption of the posterior cortex and an associated enhancing epidural mass. The sagittal image reveals exaggerated vertical bony striations within the affected vertebral body. The axial image demonstrates a bilobed appearance to the epidural portion of the mass with severe central canal stenosis and presumed cord compression. Commonly invoked radiology descriptions of this “classic” bony lesion on axial CT include a "corduroy", "polka dot", and "salt-and-pepper" appearance. The majority of vertebral body hemangiomas are asymptomatic and incidental. Rarely, lesions may enlarge and cause pain or neurological deficits due to spinal cord compression, vertebral body or arch expansion, or pathologic fracture. Additional important findings include paravertebral soft tissue extension and enlarged vasculature. Vertebral hemangiomas are highly vascular and are commonly associated with a high volume of intraoperative blood loss. Consequently, there is a preference to perform preoperative embolization prior to surgical intervention. The bilobed posterior epidural protrusion is a unique feature. The reason for this appearance is the protruding hemangiomatous masses are tethered centrally by the posterior longitudinal ligament and midline sagittal septum. Zarka AI. 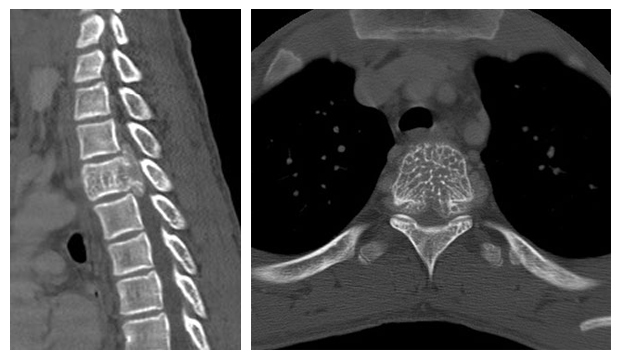 At the Viewbox: Aggressive vertebral body hemangioma. J Am Osteopath Coll Radiol. 2012;1(1):40. Dr. Zarka works in the Department of Radiology, Wilford Hall Ambulatory Surgical Center, Joint Base San Antonio-Lackland, TX.